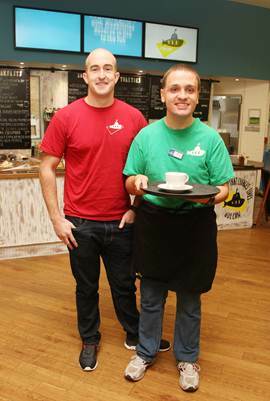 A social enterprise café is going from strength to strength after picking up glowing reviews from customers. The cafe, operated by the Yellow Submarine charity in the Windrush Leisure Centre, has earned a string of five star reviews on TripAdvisor, as well as attracting a growing number of regular customers. Paul Stanton Humphreys and Ian RigsbyThe success of the venture just six months after it was officially opened by David Cameron, Prime Minister and Witney MP, has delighted everyone involved with the venture, not least the young people with learning disabilities who operate it. Ian Rigsby, 27, who has worked as an apprentice at the café since last September, said: “I used to have a job as a cleaner but this is much better as I feel my confidence has really grown. Yellow Submarine employs seven apprentices and four trainees in Witney and at its sister café in Oxford with local apprentices attending a customer service course at Abingdon and Witney College. Paul Stanton Humphreys, Head of Enterprises at Yellow Submarine, said: “We are delighted with our success in Witney and the café will continue to grow. The project is run in conjunction with West Oxfordshire District Council which provided more than £30k towards renovations and GLL, the leisure contractor which manages the centre on the Council’s behalf. Cllr James Mills, the District Council’s Cabinet Member for Leisure and Health, said: “It is fantastic to see how the café is thriving in such a short space of time.